Problem: There is an opossum in my yard. What do I do? Solution: Nothing. Leave the opossum alone and enjoy watching wildlife in your own backyard. However, if the opossum is injured or an orphan (less than 7 inches from nose to rump) then contact the Opossum Society of the United States, a local wildlife rehabilitator, a veterinarian, or your local animal shelter for help. Opossums are beneficial eating unwanted pests around your home and garden such as snails, slugs, spiders, cockroaches, rats, mice and snakes. Opossums are free gardeners! Problem: They make my dog bark! Solution: A dog will bark at anything it sees or hears. The best thing you can do for the opossums AND your neighbors is to train the dog or keep the dog indoors at night. This will also prevent the dog from injuring or killing an opossum. Problem: Will an opossum attack my pets? Solution: In general, opossums are docile, non-aggressive animals and will not attack your pets. They prefer to avoid confrontations. If escape is not possible then the threatened opossum may “play ‘possum”, show its teeth, or bite in self-defense, as any animal would. Problem: Will an opossum bite my children? Solution: Children should be taught not to attempt to feed or touch a wild animal. Opossums are nocturnal, that is they sleep during the day and come out at night, so the chance that a small child will come into contact with an opossum is slim. Opossums prefer to sleep in dark, secluded places. If your children are playing in this type of area then there is a greater danger of being bitten by a poisonous spider or snake. Problem: The opossums eat the fruit off my trees. Solution: Opossums prefer to eat the rotting fruit that have fallen to the ground. Keep opossums out of trees by cutting branches away from the ground, fences and roof. Cover the trunk with heavy plastic sheets obtained at hardware stores and secure with duct tape. This will prevent the opossums from climbing. A cut-up plastic trash can will work. Problem: How can I keep opossums out of my home or garage? Solution: Close all doors, pet doors and unscreened windows before dusk. Put food away so the opossum will not be tempted to enter. If an opossum enters, provide a safe exit route and leave the room. Problem: I would like more information about opossums. Solution: No problem! 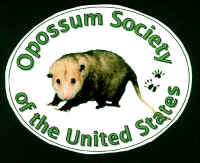 For more information please contact the Opossum Society of the United States.